A draft itinerary for Canadian visitors wanting to get a good general understanding of the role of the Canadian Expeditionary Force’s role on the Western Front from 1915, whilst putting it in the larger context of the overall conduct and strategy of the Allied Command. The tour may not follow in the order shown here, but will include everything as noted. The tour will be entirely based out of Arras. Arras is much better placed for visiting the areas of the old Western Front, and is a short drive from Ypres, Vimy and the Somme region. It is easy to get to and from Paris, with the high-speed TGV service taking just over an hour, with regular departures from Gare du Nord in Paris. The day will end with attendance the Last Post Ceremony under the Menin Gate Memorial, which commemorates over 54,000 British and Commonwealth soldiers who died in the Ypres Salient and have no known grave. Over 7,000 of these men were fighting with the Canadian Expeditionary Force. Leaving Belgium, today’s route takes us into France and past Festubert, and Hill 70, the scene of CEF actions in 1917. A stop at Loos British Cemetery is worthwhile to hear the remarkable story of Private Arthur Durie and a mother’s love of her son. 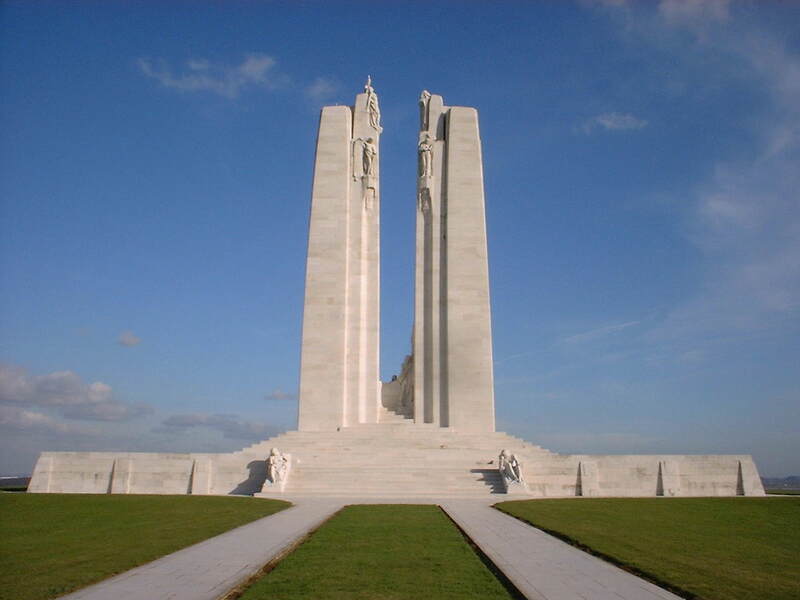 No visit to the Western Front could be considered complete without a visit to Vimy Ridge and the Canadian Memorial Park which was established there as a gift from France in the post war period. Vimy is intrinsically linked to Canada even to this day, on account of the stunning victory that was won there in April 1917 during the opening stages of the Battle of Arras. Within the Memorial Park the role of Canada’s contribution is explored, with preserved trenches and tunnels to be visited, but the highlight is to see close up the magnificent Vimy Memorial, surely the most beautiful of all of the big memorials on the Western Front. 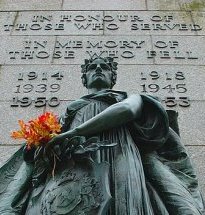 Designed by Walter Allward, a sculptor from Toronto, it was dedicated in 1936, and stands as a testament to peace, while having inscribed on the base the names of over 11,000 Canadians who died in France and who have no known grave. Standing on top of the ridge, it allows the modern day visitor an opportunity to fully understand the strategic importance of taking this vital German strong point. The Somme region is quite beautiful nowadays, as it was pre-war, with small villages located amongst rolling open chalk farmland. But in 1916, it was the scene of the first major British offensive on the Western Front, designed to break the deadlock and stalemate of trench warfare. Commencing on 1st July 1916, the battle dragged on for four and half months, by the end of which the Allies had advanced a maximum of seven miles and the British had suffered an estimated 400,000 casualties, of whom over 120,000 were dead. From a 1916 Canadian perspective, the CEF did not become involved in the fighting on the Somme until early September 1916, but, the then independent Dominion of Newfoundland was involved on the first day. As part of the British 29th Division, the Newfoundland Regiment was involved in offensive operations intended to capture the village of Beaumont-Hamel. Advancing towards the German positions from about 8.45 am, approximately 800 strong, within three quarters of an hour, the Regiment had suffered 684 casualties. It had, in effect, been wiped out. Now, as a tribute to the men who fought and fell, the Newfoundland Memorial Park is an essential stop for any battlefield visitor to the Somme. The Park has been left, as far as nature allows, in the way that the ground was in 1918. Although cleared of potential dangerous items, the British and German trench lines are clearly visible and the Park includes Memorials to the units that fought over the ground in 1916 as well as three poignant battlefield cemeteries. A walk around the park allows for a good understanding of what was both expected, and the fate that befell, not only the men of the Newfoundland Regiment, but also those of many British regiments who advanced over this ground in 1916. Canada’s major involvement in the Somme campaign commenced in September 1916, with the capture of the village of Courcelette, but soon became a slog through the autumn and early winter months of attrition, bloodshed and sacrifice. The Canadian Memorial Park outside the village remembers those men, as do the nearby military cemeteries. The Somme area has many fascinating locations which recall the largely British campaign, and nothing is more eloquent in its expression of loss than the mighty Thiepval Memorial to the Missing of the Somme, which dominates the skyline and the surrounding battlefields. 1918 was the decisive year for the Allies and men of the Canadian Corps played an important role in ensuring ultimate victory. Initially brought down from the Arras area to support the Australian Imperial Corps in their advance from Amiens on 8th August 1918, the CEF were soon returned to the familiar area of Arras, where they continued to spearhead the advance in this sector, breaking the Drocourt-Quéant Switch Line, crossing the Canal du Nord in September 1918 and securing the important high ground of Bourlon Wood in front of Cambrai a few weeks later. Thereafter, the Canadians were involved in a series of operations, constantly advancing against a still determined enemy, heading towards Valenciennes and ultimately moving into Belgium to take part in the final actions in Mons, where over four years previously, the very first shots fired by a British soldier at German cavalry men had taken place. The tour will end by returning clients to Arras for onward travel by rail, either back to Paris or to London by Eurostar. Please read the article about World War I hero Ned Quinn in the Coleraine Times. As with our other tour options, this tour will be a private, personalized tour, available anytime on a first come-first serve basis, ideally for groups of 1-4 people. As with our other tours, our personalization service allows you to participate in the structure of the tour. If you have any special requests, like following the footsteps of a particular Veteran or unit, we are happy to accommodate, whenever possible. If you do have an interest in a particular soldier or unit, please provide us with his details and we will do some preliminary research, to make your tour an even more meaningful experience. This tour, as well as our others, will be costed on the following basis. The price quoted will be for all ground transportation within the battlefield areas, with professional guide(s). It does not include anything else. Of course, we are happy to make recommendations to help with your travel planning, like hotels, B&B’s. There are many hotel booking sites but we have always liked booking.com. You will be responsible for getting to Arras and forward travel at the end of the tour, either with your own rented vehicle or the train – http://www.sncf.com/en/horaires-info-trafic/trajet/resultats. Single day tours from Paris are also available. In this case, the primary site choice is almost always Vimy Ridge, combined with a visit to Ypres/Passchendaele or to Beaumont Hamel/Newfoundland Park. All 3 cannot be done in one day. So, it has to be either Vimy/Ypres or Vimy/Beaumont Hamel. On these single day tours, our base is always Arras, given its location between Ypres and Beaumont Hamel. Here is a handy link for train service to Arras – http://www.virail.com/train-paris-arras.